You’ve made a tasty sandwich and packed it for lunch. Great! Only, it sometimes happens that another family member or a friend decides to joke around with you and eats your food when you’re not looking! 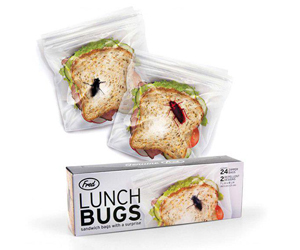 Well if you hate these situations and want some security for your sandwiches, you’ll like these Lunch Bugs Sandwich Bags. Food stalkers will be tricked, because every bag has a pre-printed bug on it!